2) more carefully researched than mine. 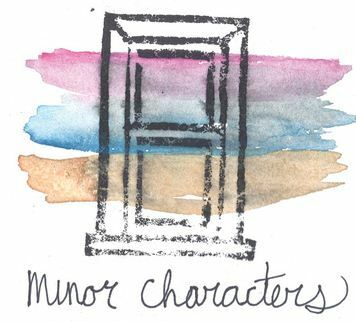 So, rather than upping my game, I instead roped my friend Scott over at Impassable Nights into doing a side-by-side review of Minor Characters’ new album with me. Hopefully the knowledge accumulated from our combined 48 years can begin to compete with middle schoolers (because yes, everything is a competition and you can win everything – often by adopting the strategy of quantity over quality). Readers can also feel free to think of this as the equivalent of 4 album reviews by 12 year olds. I first discovered Chicago Foursome Minor Characters when they opened for Portugal. The Man at the Vic a couple of weeks ago, and I was immediately a fan. They’re the kind of band you love to love: up and coming, great sound, with no pretensions and a “just happy to be here” attitude. Turns out they dropped their first EP in November of last year so of course I had to check it out. The self-titled, five track album has a gratifyingly eclectic mix of sounds ranging from a retro-pop feel on “Burden” to a 90’s punk vibe on “If I were you” all overlaid with an indie sensibility and interwoven with some excellent falsetto from lead singer Andrew Pelletier. Upon listening to it in its entirety, what struck me most was the ebb and flow of the album – one moment sweetly melodic and the next gripping you with catchy guitar riffs and engaging lyrics. You can check out the entire album on their website and if you’re feeling this band, and you decide that you can forgo that McChicken sandwich this week, the album’s on-sale for $1. This search for the next big act can be incredibly daunting. Take a snapshot of the music industry today and it’s nothing like it was 10 years ago. The Internet has transformed the music landscape; nowadays, anybody can make it big, so long as they come up with something novel, different, or at least stylish. When I first listened to this EP, my ear drew comparisons to Radiohead’s Hail to the Thief with a touch of The Shins. But that’s not for what bands want to be known. At the heart of the independent music scene, one key desire stands alone: the drive to be unique (let’s not dive into the paradox of non-conformity as conformity). I can’t quite put my finger on it, but the album really ends with a taste of its own – something authentic. Give the album a listen, and let me know if you can figure out from where this long-lost flavor came. It’s certainly not tied to your McDonald’s dollar menu. The first thing I must say about Town Hall is: thank god for a band that ‘gets’ website design. Maybe I’m just not artistic/musically minded to appreciate the thought and nuance that goes into some bands’ sites, but every time I have to ‘click to enter’ nine times before finding the actual content I’m looking for or come upon a long-outdated ‘next shows’ section I cringe. No wonder some indie bands stay small. Thankfully, Town Hall has a wonderful site: no clicking to enter, music is up front and center, contact info readily available. Check it out here . On to the music. 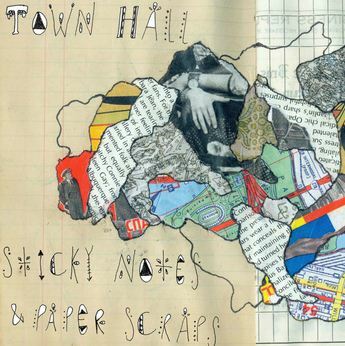 The Brooklyn-based band just released its first full-band EP, Sticky Notes and Paper Scraps. For those of you looking for energetic indie, be aware: the first word that comes to mind when listening to the tracks is mellow. Soothing is not far behind. Listen to it while you’re getting ready for bed, not prepping for a night out. The band’s tags include freak and folk, but I would put a far heavier emphasis on the ‘folk’ aspect of the sound. That being said, it’s a 100% enjoyable soothing/mellow/folskie sound. The band reminds me a bit of Nickel Creek with the plucky-string sound and the female-male duets. My favorite track is Mary A. Longdon with its line: “all the women want to know is how she keeps her skin so smooth/what pills does she take, what creams does she use.” For some reason it’s a bit haunting – definitely sticks with you. Don’t believe me? Try it out. Toronto – I find myself in something of a music rut lately. You know what I mean: it’s the sort of rut that sees you making lacklustre mix CD’s for the car filled with tunes you played to death five years ago and filling your mp3 player with old Nas and Four Tet albums for something a little different, that kind of thing. I could be getting old and nostalgic, ready to make the permanent switch to oldies and “light favourites” stations. Or possibly ten weeks of diaper changes and spit-up has been a little distracting for me. One or the other. The solution to these doldrums? Quite possibly a new Sunparlour Players album. Not to beat a dead horse or anything, as I’ve gone on emphatically about the Sunparlour Players many times before. One of the best, most intense live acts I’ve seen, Us Little Devils is the band’s third studio album after 2007’s Hymns for the Happy and 2009’s Wave North. 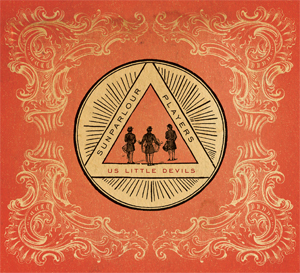 Of course, a Sunparlour Players album is really just something to listen to so you can learn the choruses to the new songs and sing along with them during the live shows. When I listen to this album I find myself mostly looking forward to hearing the live renditions and finding out how the band can pull off some of the harmonies and rich sounds with only the three of them on stage, where they’ll occasionally play five or six instruments at once between them during any given song. In the end, the new album is just ok, and probably not enough to shake me from my music malaise, but a new Sunparlour Players tour with new material to check out is something to look forward to. Check them out if you get the chance on their upcoming Ontario tour and the cross-Canada tour that’s likely to follow, you definitely won’t regret it. It’s hard to believe that it’s been a full eleven years since Chris Martin walked through the rain on the beach and delighted everyone with his simple ode to a women not named Gwyneth. That track of course, was Yellow and started the English band Coldplay on a steady rise to the top of the charts. Arguably one of the biggest bands in the world, Coldplay are now back with their fifth album, Mylo Xyloto. Having not really paid attention to the band since A Rush of Blood to the Head, I decided to have a good listen to see what the 2011 version of Coldplay has to offer. Must be the oddest title ever, but I’m not going to bother looking what this song title means. Probably something Gwyneth Paltrow discovered on the way to finding herself. How did some actress go from such a sweetheart to such an annoying figure in a span of ten years? I’m enjoying the quick pacing, soaring guitar and synthesizers on this song. If this song was released by a bunch of kids from Brooklyn (or someone in Toronto/Montreal), I’m pretty sure all the bloggers would be all over it. It’s one of the weird states of blogging today, once a band has been dismissed as a mainstream act, I feel like they have almost a disadvantage on the internet. Rolling in the millions of dollars they have helps I guess. The opening parts of this track (some high pitch rewind effect first used in Bigmouth Strikes Again) reminds me of a Passion Pit song. Where are they now? The guitars are soaring in this one though, seems tailor made for an epic arena concert moment where Walmart moms are wetting their Lululemon pants as Chris Martin pretends like he’s going to go into a crowd but then runs back on stage just to play the piano for it song’s “tender” closing moments. Tender acoustic number that evokes memories of starry nights. The whole ‘us against the world’ theme sounds like something Bono would have written in the 80s. I can’t help but feel like I’ve heard this track before, but it’s pretty catchy in the beginning but descends into your normal Coldplay yearning and long pronounciation of each word choruses. I listened to this track twice because I wasn’t really paying attention the first time. Not the most memorable track although the line “us against the world” is once again used. Not sure what Rihanna has to do with China but I guess when Coldplay comes a’callin, you don’t say no. She doesn’t really add much to it though. The dual vocal part of “you really hurt me” adds a nice bit of drama to an otherwise unmemorable song, I guess. If Coldplay really wanted to go with an edgier track, they probably should have enlisted Nicky Minaj. Slow piano falsetto number that is probably quite swoonable to a certain demographic. It’s easy to dismiss this as another Coldplay slow track but fact is most bands would give an arm and a leg to write a song like this, but since it’s Coldplay, let’s dismiss this as another slow Coldplay track for you to hold your smartphone in the air. The title reminds me of the Backstreet Boys song “I’ll never break your heart” which isn’t the best way to start off a song. In this track, pounding pianos are accomanpied by a rousing guitar riff that given other lyrics could probably pass as a song played by born again Christians in a church or something. It’s quite soaring, the church people would close their eyes, put both their hands in the air and then get down on their knees or something. Some might even faint from all the glory. Overall, it seems pleasant enough. 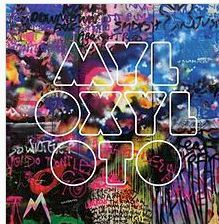 Despite the band claiming this is a concept album with a more industrial rock direction, Coldplay will always just sound like Coldplay. I don’t really think that’s a big problem for them since their sound has made them millions of fans worldwide. Would I listen to this regularly? Probably not. Would I be annoyed if someone I was in a car with decided to play this on a road trip somewhere? Probably not.